This article shows the meaning of the LED lights for your MicroBot Alert or MicroBot Push. Begin the pairing process by pressing the ‘+’ to ‘add a new MicroBot’. If you see any MicroBots in your app that show "Offline", follow these instructions to unpair. Blinks Pink (when touched) = Trying to pair (waiting for reconnection). Open the MicroBot app, click on the MicroBot name to refresh. Check that your phone’s Bluetooth is ON, Always Allow Location and Allow Notifications under your phone settings. If the problem persists, reset your MicroBot and unpair any MicroBots that show-up “Offline”. Keep the app open and maintain a good internet connection until the app displays complete. Red = Ready to reset. Touch and hold the button on top until the red light starts blinking. Blinking Red = Reset complete. Double check you have good internet connection, move to within Bluetooth range of your MicroBot and wait a few minutes. 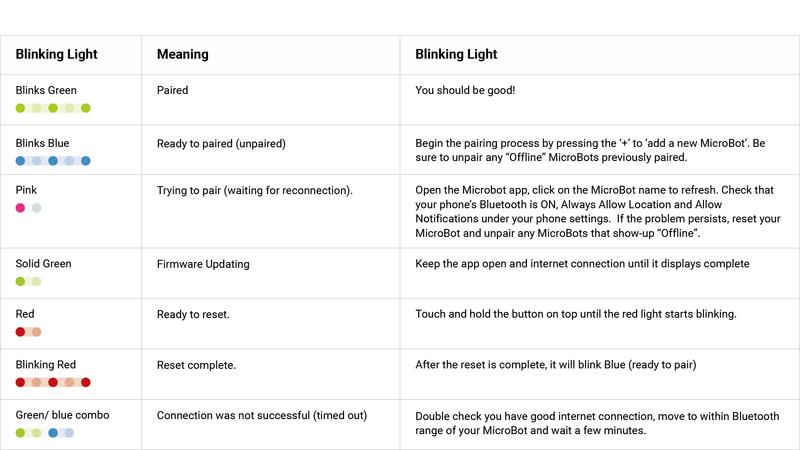 If you are unable to pair your MicroBot or do not understand the meaning of the LED lights, please see this troubleshooting article or contact us at support@microbot.is.